Offices are supposed to be productive workplaces and, while a little bit of chatting can allow for teamwork, share the workload and brighten up your day, at times there just is not enough focus in the workplace. So, what can be done to help this? Space, like time, is money. And, as such, many businesses cannot afford more office space. This is where a different office set up may help. Desk Pods are a way of creating collaborative workspace but also allowing screening and privacy so that workers can work more productively. Nowadays, people often hear the adage of doing more in less time. In order to do more and be efficient in the process, workers need to avoid distractions and businesses need to be proactive in their approach to productivity. Desk pods have been shown to increase the productivity in office workers. Sure, your workers might resist the change but, once they start reaping the benefits of their increased productivity, they will soon wonder why they never had desk pods in their offices before. Desk pods can be made from a variety of materials to create different effects and to offer differing levels of privacy, depending upon the needs of the business. They are usually made from fabric, glass or acrylic. In using desk pods, a business can take advantage of the space in their large office rooms without having to construct partition walls. They can create privacy as well as acting as sound barriers between teams or groups of people. In this way, workers can get on with the task at hand rather than being distracted by a meeting or a discussion that is taking place that is not relevant to their role. With fewer distractions, productivity increases. 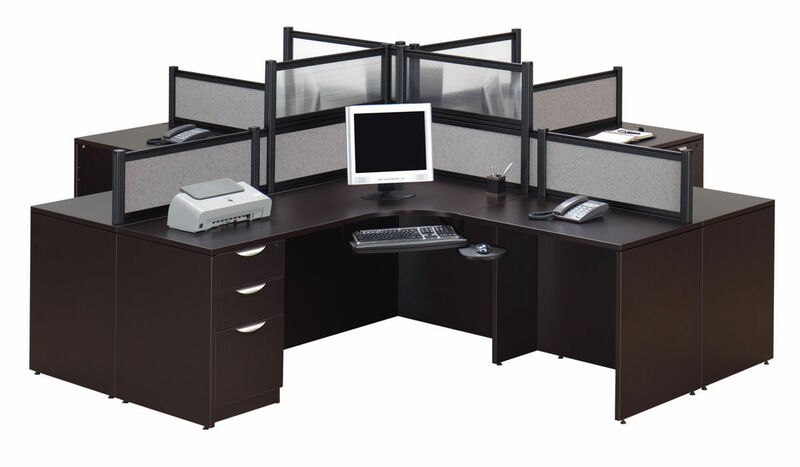 Many workstations typically have 2 to 4 workers around a large desk space in an L formation or a straight, rectangular arrangement. With desk pods, the team can still work as a group when required but have the partitions there between the desks when needed. It really is a simple solution to workplace slacking or distracted workers. With desk pods, workers are able to leave their idle chatter to the lunch run or at after-work drinks. Businesses can then reap the rewards of the increased productivity. Increased productivity, after all, is increased business.